We’d like to say a huge thank you to everyone who came out for the opening of our March of the Misfits exhibition at the Long Gallery, Sheffield Children’s Hospital. It was a super lovely night and a great turn out. Hoorah! Super-special thanks to everyone who adpoted one of the wee guys too – we managed to raise some great monnies for the fantastic Artfelt Initiative. We’ve put up a project page for the show where you can see all the misfits and some pics of the exhibition itself. The remaining Misfits are now online and looking for happy homes to go to! PLease take the time to check them out. 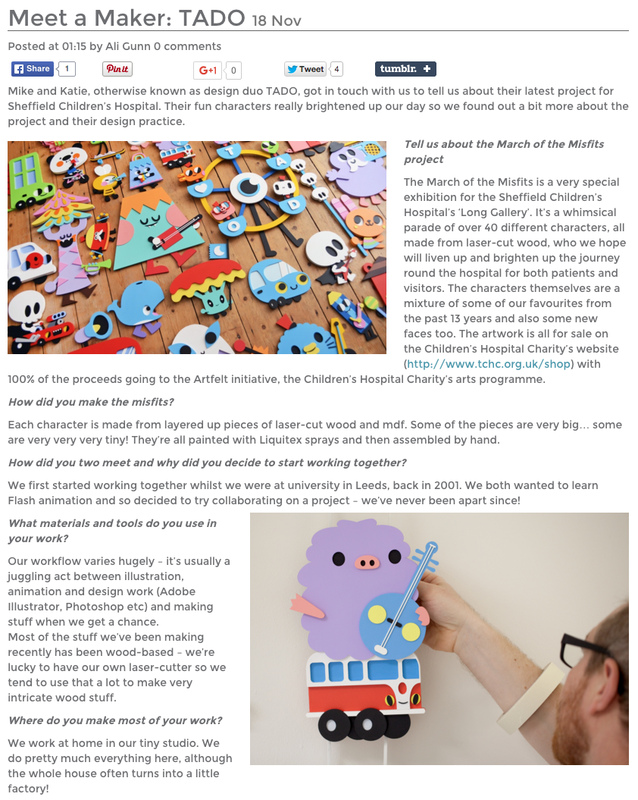 Finally we’d like to say a big thank you to the lovely folk at Fred Aldous for shining a spotlight on us and the March of the Misfits exhibition! You can read the full thing on the Fred Aldous Blog here.